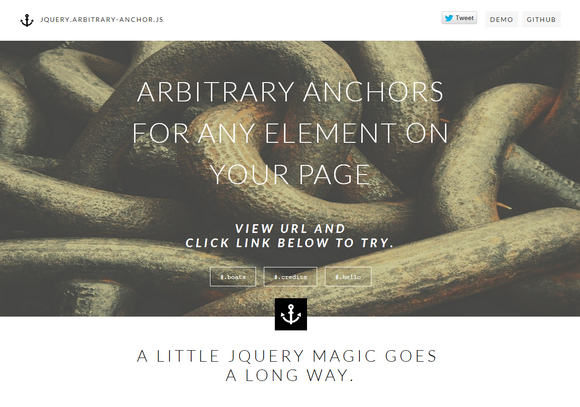 jQuery Arbitrary Anchor Plugin allows the page to scroll to any arbitrary object on the page based on jQuery/CSS selector. you can easily create useful and neat dynamic anchor scrolling by simply adding a jQuery/CSS selector after the hash (#) in your page’s URL. This plugin extends the normal anchor functionality, that is, an anchor tag with a name value attribute will still get scrolled to as normal. The same goes for an element with an ID which matches the hash. This little plugin will take care of everything else. this looks very interesting — definitely will check it out. thanks!